Which Three Man Utd Players Must Alex Ferguson Sell This Summer? Which three players do you choose to get rid of? The Berba? Anderson? Not sure how much money they have to spend, but they are definitely too light weight in terms of strikers. Not counting Michael Owen, it has to be berba, carrick and anderson. Even though I think it would be right to give Anderson another year where he is not injured and has a chance to play consistently….hopefully he can have a rebirth like the one nani is apparently having. Park has to stay. Talismanic performances this season. 1.It might be Carrick,who has terrible season, but Fergie won`t do this. 2.May be Hargreaves,but it depends from his health situation. 3.Berba is just not that kind of forward.I suppose he will have at least one season. 4.Ando is a great prospect,he`ll stay. And I would like to see Gourcuff in Man United squad. Carrick – Very poor under pressure. Berbatov – Lack of movement, not suited to United’s style of play. Hargreaves – If he isn’t fit for pre-season it’s a lost cause. United must buy another forward to partner Rooney and they need a world class attacking midfielder and a ball winner in the middle. 1. Berba, a slow coach. Cant match uniteds style of play. 2. Scholes cant keep up the pace. 3. Foster, conceding 11 goals in 10 matches is not a Manutd trait! Berbatov and Carrick to go… Anderson to stay he is a sublime prospect and with Gibson and the returning Cleverly will provide you youthful exuberance to and ageing midfield. Owen is unreliable and should be replaced. Rooney Bennzema and Macheda up front with maybe Wellbeck. Foster should be let go and replace by Hugo Lloris. Bring De Rossi in for experience and strength. Carrick – doesn’t deliver in the big games, Gourcuff would be good. Would make for a pretty hefty transfer bill though. Can they just bring back Roy Keane? I’d give anything to see him and Viera go at it again. 1. 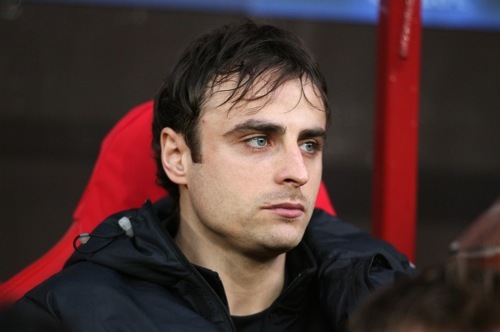 Berbatov – I personally love the guy but he is a square peg trying to fit into a round hole and it’s just not working. 2. Anderson – There have been very few players I have ever taken a real disliking to when playing for United, but this guy gets on my nerves. Can’t wait until I can say good riddance to bad rubbish when it comes to this talentless muppet. 3. Ben Foster – Many have forgotten just how useless and truly awful this lad is when in goal. I haven’t. Be gone with him and his poor keeper mechanics. 1. Jack Rodwell – The midfield needs a wakeup call and this player reminds me of a young Michael Ballack who plays box to box and can even score goals. 2. Manuel Neur – The best young keeper in the world and no chance of getting him now after Fergie’s “typical Germans” line confirmed what i have known all along, Fergie hates Germans. In my op. Berbatov should be the first exit from ot this summer bcos too slow for united style.should be replaced by villa/torres.Foster should be the second;for carrick he’s talented but always quite in big clashes.Ifhargreaves is fit hopefully the midfield is ok,if not the right man is de rossi.Anderson should be given a final chance next season. I would sell ANDERSON, DIOUF, FOSTER and BERBATOV. D. Villa, some very good goalie for the future and a creative midfielder… someone like Iniesta, Fabregas, Lampard, Xavi or a young Scholes. A midfielder who can score goals and made them. Don’t need to be very good at defence as we already have Fletcher, Hargreaves and Carrick (come on he’e not bad). I think what we need is attack power… we only have ROONEY and look what happens when we don’t have him. And give Michael Owen a chance. He’s never going to be a regular but he CAN score goals when players like Berbatov hide thenselves or just miss it. Give him one chance in a big game and i’m sure he will score. I wish, wish, wish Carrick would go. Been saying this for years now, but Fergie bums him for some reason. The first 2 simply do not fit in the Man U system of pace and counter attacking. They are the very anti-thesis of pacy counter-attacking football. Carrick did a good job when we needed him. He should leave while United fans are only starting to murmur their discontent and not turn on him completely. Berbatov was a complete waste of money. He is talented. Unfortunately, he does not have qualities United need. Alternatively, let go of Owen, sign another quality striker (I like Dzeko) and keep Berbatov 3rd choice… if he is happy to be so low in the pecking order. Macheda should be fourth choice. Foster is not happy at United. And he cannot seem to take the pressure of playing for United. Get rid of him and sign Neuer please! Not sure if Kusjzack is happy to be 2nd choice. If not sell him as well, and sign another good young keeper as reserve. Also United need 2 quality midfielders. Our midfield was atrocious in the last 3 games. We need someone who is happy to keep hold of the ball and passes well… while keeping up with the pace of the game. If we could afford him, I would love Hamsik at United. We also need an enforcer if Hargreaves does not recover fully. And Scholesy should retire… Gary Neville and Giggs can still do a job against the smaller teams and can slowly faze out next season. Likewise VDS. Its simple as i thought. first,berba didn’t live the expectation since his arrival,just doing 360 here and there,and its definitely not helping.As he also slow down the tempo,and cannot work as a lone striker.Should be replace by BENZEMA/HULK. third,i definitely sure fergie need to overhaul his team,by terminating scholes and giggs,as they couldn’t perform always in Man Utd shirt.Should be replace by SILVA,since what we need now is creativity!!!!! The whole Manchester united franchise is so bad, mostly Garry Neville (After trying to make seductive moves on the poor Argentine-Maxi Rodrie) I personally think they should give up on life. Oh and Valencia’s nice little cry baby act after a German tackle in the Champions League at Old Trafford against Bayern was disguisting. Obviously I’d love to see Villa, Silva, Gourcuff, Hamsik, ‘someone like Iniesta, Fabregas, Lampard, Xavi or a young Scholes’ but I think Fergie’s budget probably runs to what we can recoup from selling players and the always enticing offer of a nice lemon meringue as a little extra. Firstly, I’d have Carrick out. Not too bad a player and I’m not sure where he’d go but I think we need someone a bit more dynamic and creative. Fergie missed a trick by not going in for Sneijder last year and he ended up at Inter for something like e13m. For me, I’d love to see Van der Vaart in the middle and I think he’d be very affordable and great value. Regardless of what we rake back I think we should lose Berbatov, we can’t afford to carry him in the team – he slows us down far too much. I was impressed by the way Ivica Olic often seems in the right place at the right time over the two legs of the QF and we have a history of going in for players who have done a decent job against us – also, I don’t think he’d be mega millions to sign. I’m not a Berba Basher or anything, I just don’t think he’s worth the money we’ve paid (and continue to pay) in wages and fees. Also, Ben Foster. Not good enough. Take your pick from the current goalkeeping flavour of the month for who we sign as a replacement – history suggests we will struggle to replace VdS and it will be a sad, sad day when he retires. He’s just magnificent. SAF won’t lose any of his English players except maybe Foster. When the new rules come into play he’ll need as many as he can get. And Michael Owen scores goals purely for fun in any and all competitions. Pressure is not a word in his dictionary, not to mention he has a great attitude and was a free and is paid half of what Berba most likely is. Fletcher, Carrick and Scholes must go. Vast wages for players that edge mid table standard on a good day. I think Sir Alex will stick with his midfield players. Carrick has had a bad spell this term, and there has been some problems with Anderson. But Anderson is still young and if he can get a good run in the team next term, he might get to the next level as Nani have done in the second half of the season. But if one midfielder has to go, I would sell Carrick. We might get 10 millon for him…. Then go for Di Rossi for around 25 million. The strike force behind Rooney is not there. Rooney has been doing it all alone this season. The last successfuly years we had Tevez and Ronaldo. Berbatov has skills, but as everyone can see, he hasnt the skills United need. His to slow. U cant put the ball behind the defenders and even if he can dribbel a man, its in slow motion. United is all about pace when attacking and with Berba u will never get that. If we can get 15 mill for him we should sell him and go for Benzema. I try to strike a deal with Madrid at around 20 million. Sell Foster for 3,5 million, get Neville to call it a day. Pray to God that Heargreaves still can recover and thats it. We have Van der Sar one more year, and canlive with Kusjzack as number 2. Then go for a world class keeper after next season! If Sir Alex do something like this, ill bet we will go for futher greatness next season. The key is two class players comming in, one in central midfield and one poacher up front with Wazza! What do you think where Berba will head at? La Liga, Serie A? Sell – Berbatov – has skill but not enough for united, Carrick – complete waste of space (worst utd midfielder of all time?? ), Foster – simply inept. Buy one creative central midfielder and a pure striker to partner Rooney. Give Hargreaves another year, if still crocked bugger him off to some coastal town to enjoy his retirement…. Same goes for Anderson, he has huge potential, but has only shown glimpses of it. Finally, learn that Ryan Giggs is useless in centre midfield, he is a left winger full stop. berbatov the biggest man u flop ever, i’ll personally have a party when he is sold in the summer. we need to get benzema to replace him. anderson is useless because he never scores so we need the excellent james milner to come in and get us some goals from midfield. wes brown must also be sold as he is just not good enough to cover rio and vida so we need kjaer and the defensive duties need to be shared between these 3. Sign: CM: Hamsik- 25 million, or Pjanic- 20 million, or Gourcuff- 30 million, or Milner 20 million. LW/FWD: Hazard- 20 million, or Di Maria- 25 million, or Aguero 45 million. Berbatov out for 15 million. Try and lure benzema to old trafford for around 20 million. Anderson out for 15 million. Try and snap up pjanic and hamsik for 20 million each. Wes brown out for 10 million. Chielini would be great value at 12 million. Please show Forster the exit for 10 million. Hugo lloris and akinfeev for 10 million each. FIRST OF ALL ALEX FERGUSON RETIRE AND REPLACE WITH JOSE MOURINHO. Roswell gosling milner agbonlahor onloan to former clubs for one season. he doesnt need 2 sell any1 as no players are dat bad. but wud b nice 2 hav sum1 like van persie or diego millito or huntellar up front. in midfield sneidger or van der vaart. in defence would like 2 see sergio ramos at right back. Berbatov, Michael Owen, Anderson, Obertan, Hargreaves, Wes Brown and I would not offer a new contract to Gary Neville. United must start to bring down the average age of the team. Van Der Saar will be 40 next season. The bulk of our defenders are hovering around the age 30 mark (Ferdinand, Brown, Vidic, Evra, O’Shea). Our midfield lacks both a general and a playmaker, the fact that Giggs and Scholes are still such important players, shows the real lack of quality of the rest. A goal scoring midfield player and another top striker to take some of the pressure off Rooney is a must. Recent games have shown that we are becoming a one man team. sir alex should sell berbaov and get benzema instead,david silva a replacmen for the legendary giggs and hamsik shouls fi quite righ for scholesy. David Villa for the obvious first choice. I’d ultimately see Gibson pushing Anderson out of the club and it would be a shame to spend money to deny the lad a place. Our problem this season has been when Rooney’s not fit there’s no replace. Yes, on most occasions someone has stepped up to the mark in the form of Giggs, Nani, Fletcher but I’d still like to see that star signing. I’ve already chosen Villa so why not bring in David #2 Villa. They both have a price but I don’t imagine much of that will be covered by Berbas sale. Only need to sell Anderson Berbatov Diouf Kuszczak Tosic and Foster.